Connect changes in the Earth’s atmosphere with evolutionary changes in the Earth’s biosphere. Explain the fundamentals of stratigraphy. Identify the appropriate uses and limitations for various methods of dating, including carbon-14, potassium-40. Identify major geological periods with respect to the history of life on Earth. Recognize the features of adaptive radiations and mass extinctions. Evolution writ large takes a great deal of time. Natural selection will favor different genetic variants as geologic conditions change, such as climate, chemical composition, and sea level. A key of Charles Darwin’s thinking was his study and familiarity with the latest advances in the science of geology, including the works of Hutton and Lyell. And interpretation of the fossil record, and inferring the sequence of evolutionary changes, would be impossible without a grounding in the fundamentals of stratigraphy. igneous – rock formed from cooling of lava. Any organismal remnants are destroyed by the extreme heat of the lava. metamorphic – rock whose crystal structure is altered by extreme heat and high pressure when buried miles deep in the Earth’s crust; may be formed from either igneous or sedimentary rock. Any fossils contained in sedimentary rock are destroyed during the transformation to metamorphic rock. sedimentary – rock formed by deposition of fine sand and particles of organic and inorganic debris at the bottoms of oceans and lakes, compressed and often visible as layered rock formations. May contain fossils. Stratigraphy applies to sedimentary rock formations. The fundamental principle is that newer layers are always deposited on top of older layers. Therefore, a vertical dig reveals a historical record, with deeper digs revealing older sedimentary deposits. However, crustal movements and uplifts may cause these layers to tilt, fold and even become inverted in some locations. In addition, erosion can cause loss of layers and gaps in the rock record, called unconformities. Potassium-40 (K-40) decays to argon-40 (Ar-40); half-life = 1.26 billion years; used to date formation of igneous rocks. Ar-40 found trapped in the rock is compared to amount of K-40 remaining. A 1:1 ratio of K-40 to Ar-40 indicates the igneous rock has an age of 1 half-life, or 1.26 billion years. Uranium-238 (U-238) decays to lead-206 (Pb-206); half-life = 4.5 billion years; used to date zircons (see “How to Date a Planet” video above). Again, the ratio of U-238 to Pb-206 reveals how many half-lives have passed since the zircon crystal was formed. Carbon-14 (C-14) decays to nitrogen-14 (N-14); half-life = 5715 years; used to date organic matter. In this case, the amount of the daughter isotope (N-14) is uninformative, because N-14 is the common isotope of nitrogen and occurs at high levels in all organic matter and in the atmosphere. Only the amount of C-14 compared to the amount of C-12 matters. The ratio of C-14 to C-12 has been mostly constant over the last 100,000 years, so newly created (by photosynthesis) organic matter starts out with a certain ratio of C-14 to C-12 that is similar to the present-day atmospheric ratio of C-14 to C-12. Depletion of C-14 relative to C-12 is used to date the age of organic matter. After 5700 years, the ratio of C-14 to C-12 will be only half of the initial ratio of C-14 to C-12. This figure shows exponential decay of a parent radioactive isotope, contrasted with the linear decrease of sand in an hourglass. For samples containing organic carbon, the fraction of C-14 remaining in the sample can be used to determine how many half-lives, and hence years, have passed since the organic matter was formed. A common misconception is that scientists use carbon-14 to date rocks or fossils that are millions of years old, such as fossil dinosaur bones from 100 million years ago. Instead, scientists date igneous rocks found in layers above and below the sedimentary rocks containing the fossils. Why isn’t carbon-14 useful for dating fossil dinosaur bones? However, humans are very bad at thinking about time. But we’re pretty good at thinking about distance. So let’s “map” the different periods of Earth history and major evolutionary milestones onto a – you guessed it – map. Let’s take a trip from Disney World to a classroom inside the Clough building on Georgia Tech campus. If the location of Disney World in Orlando, Florida is the origin of the Earth (A), and the Clough building is present day (B), that means we have 441 miles to travel 4.6 billion years. The oldest evidence for life is about 3.8 billion years old. That means we’ve traveled almost a quarter of the whole distance, so we’re in Gainesville, Florida before there is any evidence of life on Earth. University of Florida gets to claim origin of life! There was no oxygen in early Earth’s atmosphere or oceans. Increases in ocean and atmospheric oxygen levels begin with appearance of cyanobacteria about 2.7 billion years ago (Bya). That means it takes almost half trip: we’ve traveled about 200 miles and we’re at the GA/FL border before we start seeing evidence of increasing oxygen levels on Earth. The first eukaryotes appear in the fossil record after oxygen begins to accumulate about 1.5 BYA, about halfway between Tifton and Macon, near Cordele, GA. This isn’t much of a landmark, but we could stop and get lunch. Oxygen didn’t accumulate all at once, and evidence indicates that the oceans weren’t fully oxygenated until 850 milling years ago (Mya), which puts us all the way up to Macon, GA – only about 80 miles from Tech. Much of the life on earth was singled celled until shortly before the Cambrian “explosion,” when we see emergence of all modern animal phyla. The Cambrian radiation (meaning rapid evolutionary diversification) occurred approx. 540 Mya, which puts it north of Macon in High Fall State Park. This is the first part of the Paleozoic (early animals) era. The largest mass extinction in the fossil record occurred at the end of the Permian period (299-252 Mya), near McDonough, GA. The first mammals appear during the Jurassic period (200-145 Mya), or just inside the I-285 Perimeter. Dinosaurs became extinct at the end of the Cretaceous period (145-66 Mya). This is solidly inside the Perimeter. The first apes appear in the fossil record about 25 Mya, or near the intersection of I-20 and the I-75/I-85 Downtown Connector. We’re almost to Tech campus now! Let’s move onto Tech campus now. Human evolution occurs entirely on Tech campus. The fossil Lucy (Australopithecus) dates to approximately 3 Mya, or right around Tech Tower. Modern Homo sapiens arise and migrate out of Africa inside Clough Commons. Neanderthals go extinct inside the classroom with us. Recorded human history occurs in the current Holocene epoch, from 11,700 years ago to the present, or about 6 feet from where you are sitting in the classroom. The Holocene epoch is the last part of the Quarternary period (2.59 Mya-present), which in turn is the last part of the Cenozoic era (66 Mya-present), which in turn is the last part of the Phanerozoic eon (540 Mya-present). The average first year student at Tech is about 18 years old. On this scale, that puts their age at about 1/10th of an inch. Remember, we started out at Disney World, about 441 miles away (4.6 billion years ago)! The geochemistry of the Earth’s atmosphere, water and land surfaces have shaped the evolutionary history of life. And in turn, major changes in the biosphere have profoundly altered the chemistry of the Earth’s water, atmosphere, and land surfaces. 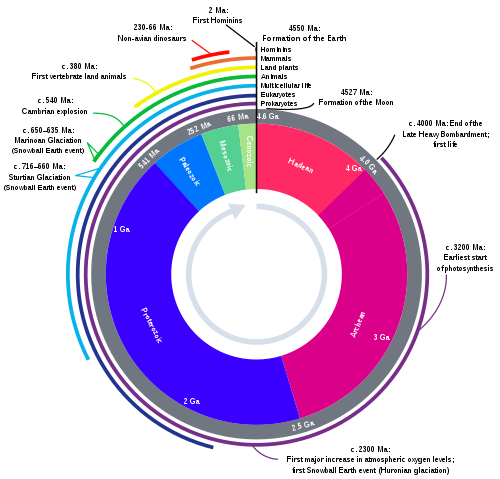 The figure below shows milestones in the 4.5-billion year history of the Earth, changes in atmospheric oxygen levels, and the timing of the origin of microbial life and the origin of eukaryotes. The Cambrian “explosion” refers to an increase in biodiversity of multicellular organisms at the start of the Cambrian, 540 million years ago. Multicellular life appeared only several tens of millions of years before the start of the Cambrian, as enigmatic fossils (Ediacaran biota) exhibiting body plans unlike present-day animals. These largely disappeared and were replaced by Cambrian fauna, whose variety includes all of the body plans found in present-day animal phyla. The appearance of Cambrian fauna span millions of years; they did not all appear simultaneously as the term “explosion” inaccurately implies. Periods of increasing biodiversity and rapid speciation are called evolutionary radiations. They occur when new ecological niches become available, as after a mass extinction. They may also occur in response to an evolutionary innovation. One example would be the evolution of jaws. The ability to bite gave predators a huge advantage. Prey species adapted in a variety of ways, such as faster speed, body armor, defensive weapons such as horns and stingers, chemical defenses in the form of poison, larger body size, smaller body size, etc. The Cambrian radiation also coincides with an increase in free oxygen to near-present day levels. O2 build-up in the Earth’s atmosphere. Red and green lines represent the range of the estimates while time is measured in billions of years ago (Ga). Stage 1 (3.85–2.45 Ga): Practically no O2 in the atmosphere. Stage 2 (2.45–1.85 Ga): O2 produced, but absorbed in oceans and seabed rock. Stage 3 (1.85–0.85 Ga): O2 starts to gas out of the oceans, but is absorbed by land surfaces. Stages 4 and 5 (0.85–present): O2 sinks filled and the gas accumulates. The increase in oxygen enabled the evolution of larger bodies and organs and tissues, such as brains, with high metabolic rates. The increase in oxygen is a dramatic example of how life can alter the planet. Evolution of oxygenic photosynthesis changed the planet’s atmosphere over billions of years, and in turn caused radical shifts in the biosphere: from an anoxic environment populated by anaerobic, single-celled prokaryotes, to eukaryotes living in a micro-aerophilic (low-oxygen) environment, to multicellular-organisms in an oxygen-rich environment. Humans are the latest in a succession of evolutionary innovations, who are now altering the planet, with yet undetermined consequences for life on Earth. No other planet in our solar system has oxygen gas in the atmosphere. Oxygen is highly reactive, and quickly consumed by oxidation reactions. On Earth, oxygenic photosynthesis continually replenishes the oxygen consumed by respiration and other oxidative processes (e.g., rusting of iron, weathering of rocks). The history of oxygen gas in the Earth’s atmosphere sums up the history of life. The evolution of water-splitting and oxygen-generating photosynthesis by cyanobacteria led to the first free oxygen dissolved in ocean waters about 2.6 billion years ago, which reacted with soluble iron and precipitated iron oxide (rust) from the oceans (now visible as banded iron formations in sedimentary rocks from that period). Oxygen dissolved in the water column led to more efficient (aerobic) metabolism, and eventually enabled the evolution of eukaryotes (around 2 BYA), and the first multicellular organisms (around 800 MYA). Oxygen gas in the upper atmosphere formed the ozone layer. The ozone layer absorbed harmful UV rays and allowed animals and plants to colonize land surfaces (350 MYA). Burial of large quantities of organic material in anaerobic sediments (eventually turning into coal and petroleum) allowed oxygen to accumulate in the atmosphere to present-day levels. Q: why is burial of organic carbon necessary for oxygen to accumulate in the atmosphere? Here’s a link to an HHMI Interactive on the oxygen history on earth. Select region 2 and click on “Howie” to step into an explanation of the two hypotheses of how oxygen outgassed into the atmosphere. The Earth experienced large swings in global temperature, from “snowball” to hothouse, and intermittent glaciation. Note the conditions during the entire period of hominid evolution (circa 3 Mya) and recorded human history (circa 10 Kya). Also note the change in scale on the X axis (time). Multiple factors caused these large swings in global temperature, including changes in solar output, extreme volcanic activity, meteor strikes, and atmospheric greenhouse gases, such as carbon dioxide. The figure above by Foster et al. shows that carbon dioxide levels above 400 ppm are now the highest in the past 10 million years. Radiometric Dating: A Christian Perspective a long and thorough, and yet very readable, explanation of how radiometric dating works, how the techniques are calibrated, the sources of error. The “Christian perspective” is about countering young-Earth misconceptions from any religious belief. Written by: Jung Choi on August 24, 2013. So, from the youtube video, it’s predicted that the continents will merge back together? Apparently so, but this is beyond my area of expertise.